Discover all the looks from this year’s Victoria’s Secret Fashion Show held in New York. The show was divided into seven themed sections: Glam Royale, Golden Angel, Flights of Fancy, Pink, Floral Fantasy, Downtown Angles, and Celestial Angels. Sixty models including angels Adriana Lima, Behati Prinsloo, Candice Swanepoel, Elsa Hosk, Jasmine Tookes, Josephine Skriver, Lais Ribeiro, Martha Hunt, Romee Strijd, Sara Sampaio, Stella Maxwell, and Taylor Hill, were joined by performers Bebe Rexha, The Chainsmokers, Halsey, Kelsea Ballerini, Rita Ora, Shawn Mendes and The Struts. Victoria’s Secret Angel Elsa Hosk had the honor to wear this year’s $1 million Fantasy Bra, designed by Atelier Swarovski. After 20 years and 18 Victoria’s Secret’s fashion shows, Brazilian supermodel Adriana Lima said goodbye to the brand. “Definitely one of the most memorable/emotional experience in my life. So much love from the angels/the Victoria’s Secret team. I am grateful for have been part of this beautiful family for 20 years of my life. Thank you from the bottom of my heart for all the love and I hope that I can give all this love back to each and every one of you. To my fans, I am grateful for all your support and standing by me no matter what! Love you all…. from my heart. Dear Victoria, Thank you for showing me the world, sharing your secrets, and most importantly not just giving me wings but teaching me to fly.” – Lima wrote on her instagram. Kendall Jenner is back on Victoria’s Secret runway in a tartan inspired outfit. 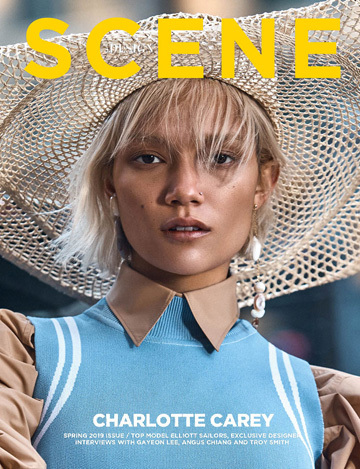 DESIGN SCENE Issue 27 cover star Lameka Fox is VS runway girl for another season! Don’t miss our exclusive interview with Lameka. Superstar Barbara Palvin is Victoria Secret’s golden girl. Candice Swanepoel who gave birth earlier this year is back on the runway in top shape. DESIGN SCENE cover girl Shanina Shaik is radiant as always in her VS comeback after taking a break for a few seasons. Read our exclusive interview with Shanina Shaik. Martha Hunt remains a stunning regular for another season. Sublime as always supermodel ELSA HOSK takes the show. Superstar Devon Windsor takes the spotlight with her angel wings for the Victoria’s Secret 2018 show. Bella Hadid returns to the runway in a lace taken feather outfit. Duckie Thot in her VS runway debut! Supermodel Adriana Lima is moon and the stars for her final Victorias Secret runway show.